Wooded mountains cut by rocky ravines and majestic gorges make Welgevonden perhaps the most scenic of all the major reserves! We love the huge standalone baths and outdoor showers looking out on the bush! 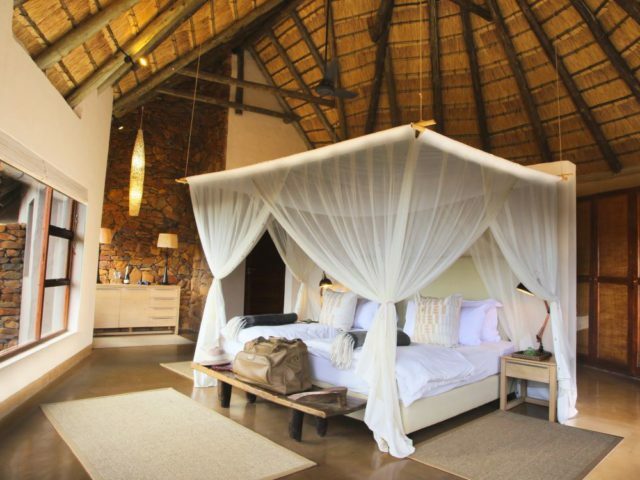 Situated in the heart of the malaria-free Welgevonden Private Game Reserve just 3 hours north of Johannesburg, Ekuthuleni Lodge (meaning "place of peace") is situated in prime game-rich grassy plains. The adventure starts when you arrive at the reserve’s main gate where you leave your car (no private cars are allowed in Welgevonden) There you’ll be met with a cold beer for the hour long 4x4 transfer back to the lodge which is basically your first game drive! Arriving at the lodge you’ll find an intimate camp enjoying sweeping views of the savannah plains and with the rolling wooded mountains forming a stunning backdrop. The Welgevonden exhibits a rare and rugged beauty – in fact it’s perhaps the most scenically beautiful of all of the large reserves, a diverse slice of Africa featuring rocky plateaus, open woodlands and grassy plains dissected by crystal clear streams, ravines and stony gorges. At some 37500 hectares this is a huge area and home to a fantastic array of game including the Big Five of course (in fact it sports one of the largest populations of white rhino on a private reserve anywhere in Africa) not to mention over 300 species of bird of which South Africa’s national bird - the blue crane - is a rare and special member. In fact Welgevonden is one of the country’s true conservation success stories given that most of the big game was eliminated through hunting back in the 19th century – since then a massive game restocking exercise has seen this become an excellent game viewing destination! 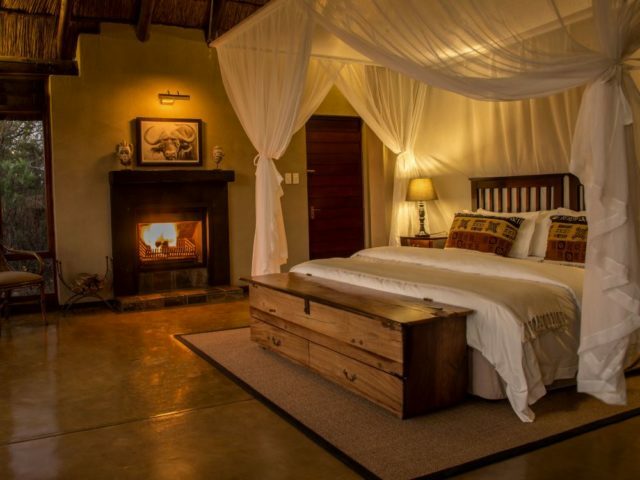 Ekuthuleni Lodge is actually the oldest of the lodges in this comparatively young reserve and you can relax in one of 5 suites which offer intimacy and privacy, as well as magnificent views of the grasslands. The lodge is unfenced meaning that animals are free to wander through the camp, giving a whole new meaning to having nature on your doorstep! Each suite is spacious with stone feature walls that are also a signature styling feature in the main public areas of the lodge. Our favourite feature though has to be the romantic en-suite bathrooms that open onto a private courtyard and with both indoor and outdoor showers – we particularly love the huge free-standing baths! 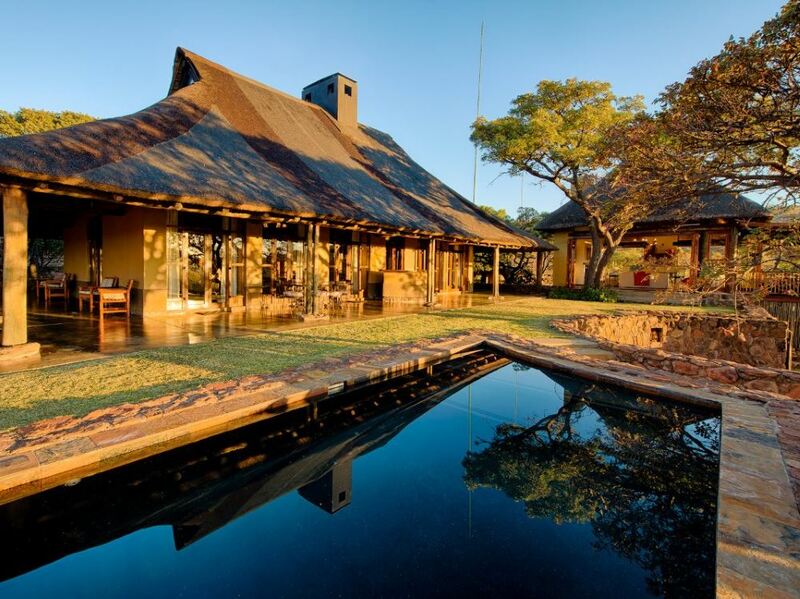 The main lodge invites you to relax next to the swimming pool overlooking the sweeping grassy plains where you can bask in the sun with a good book before taking a refreshing plunge! There’s an elegant furnished lounge and dining room including a gorgeous large central fireplace perfect for those chilly winter months where you can get cosy with a glass of red wine in front of the crackling fire! You’ll enjoy delicious meals either in the cosy dining room if the weather’s a bit dodgy or perhaps out on the open air deck, sheltered from the elements by a reed awning. On clear nights what could be better than dinner in the boma next to the pool, under the starlit sky with the sounds of the wild as your background music! And the real beauty of Ekuthuleni is that no matter where you are in this lodge – whether you’re in the main lodge, relaxing in your suite or chilling on the pool deck - you’re always able to enjoy the views of the animals grazing on the plains. Whilst there’s good game viewing from the lodge itself, you’ll no doubt want to explore the reserve and go in search of big game on your two daily game drives - they’re conducted by experienced rangers who will provide intimate details of the abundant flora and fauna, much of which is unique to Welgevonden. The reserve boasts excellent sightings of rhino, elephant and lion in particular (leopard as so often are more elusive and you’re more likely to have sightings of this iconic cat at somewhere like the Sabi Sands) There are rare and unusual species to be seen too, such as brown hyena, aardwolf and aardvark – all best seen at night. As you sit on the open 4x4 vehicle you can watch as the bush wakes up in front of your eyes - The grassy plains abound with antelope from the largest eland to the diminutive duiker, and the predators are never far behind! Evening drives always have an especially exciting sense of anticipation as you never know what lurks in the darkness, and with the predators generally being more active at night, you may even get to witness a lion kill or spot some of the rarer cats like civets or genets! Other activities you might find appealing is gazing up at the starry sky – where a guide will come to the lodge with a telescope and give you an amazing insight into the night sky for an evening of “astronomical” entertainment. 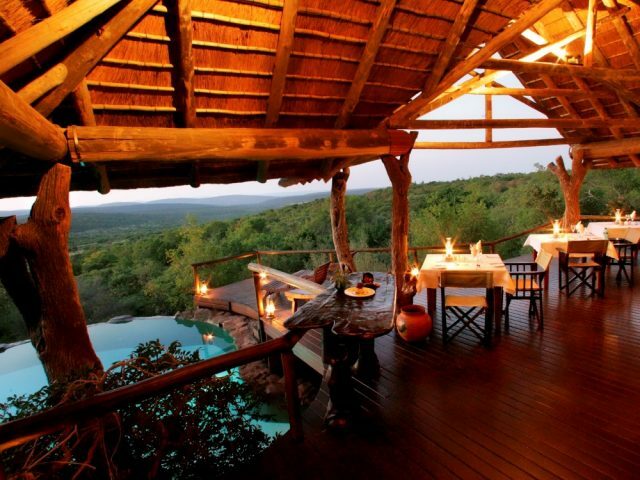 Ekuthuleni Lodge ensures that your stay is uninterrupted by the demands of the outside world. Within this spectacular landscape with its mountains, rivers, plains and gorges you’ll no doubt find relief and peace and return to the city with your batteries well and truly recharged! 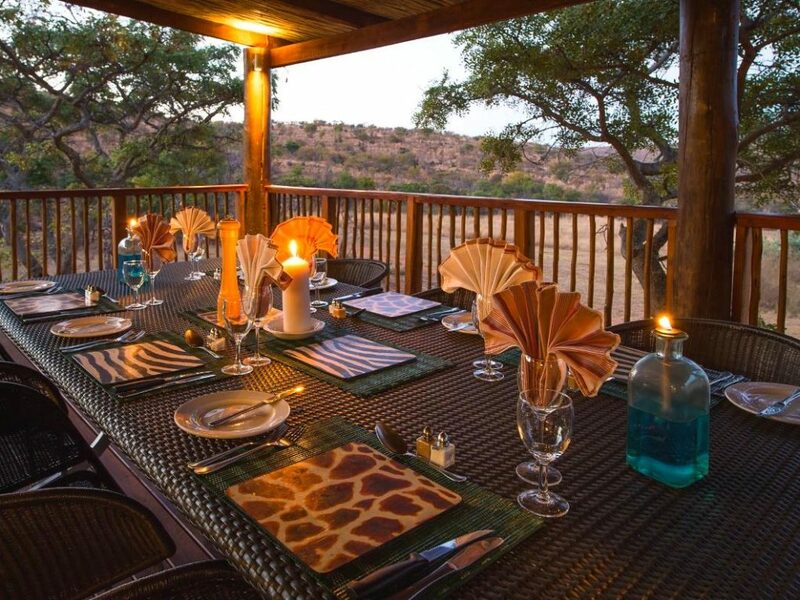 An understated lodge that delivers wonderfully warm personal service and an authentic bushveld experience - gets consistent rave reviews from guests!